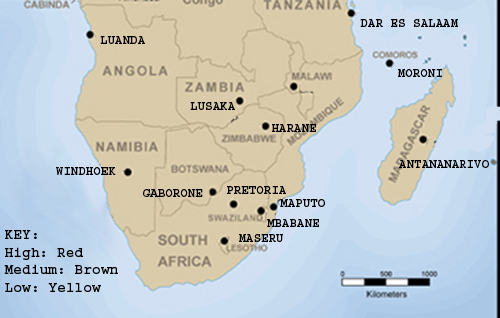 The region of southern Africa is located between roughly 10° S to 35° S (latitude) and 10° E to 40° E (longitude). 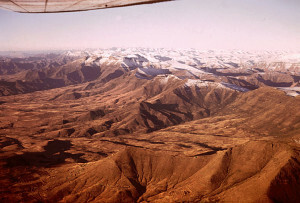 The region is very diverse topographically (physical features), in climate and vegetation. 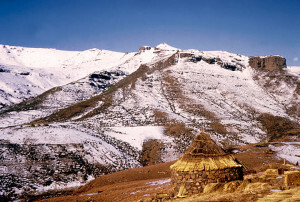 The region is comprised of lush coastal plains, high snow-covered mountains, savannah high plateaus, and arid deserts. Carefully study Map Five: Physical Map of Southern Africa. 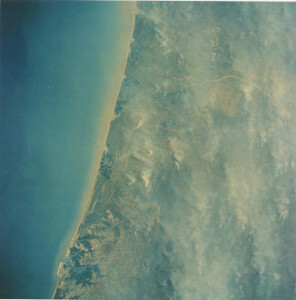 Starting from east to west how would you describe the topography (physical landscape) of the region? 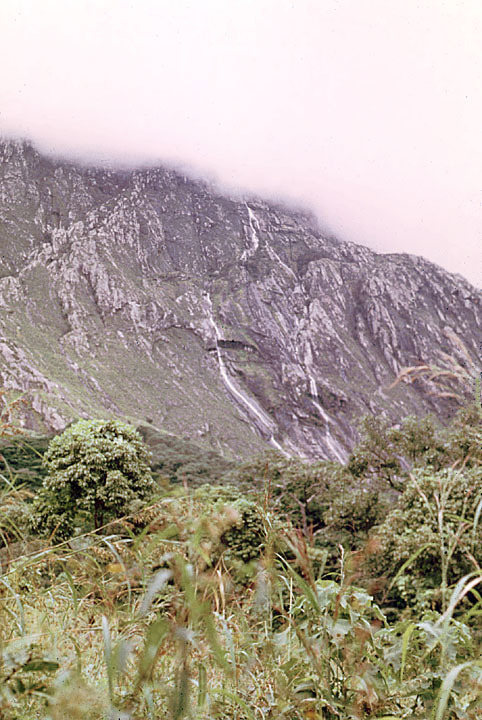 High Land (mountains): You will note a spine-like chain of mountains that run the entire length of the southern African region just west of the eastern coastal plain. 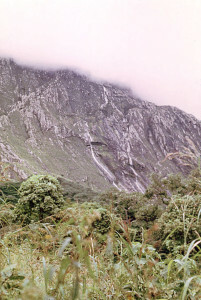 These mountains often reach the height of 10,000 feet. 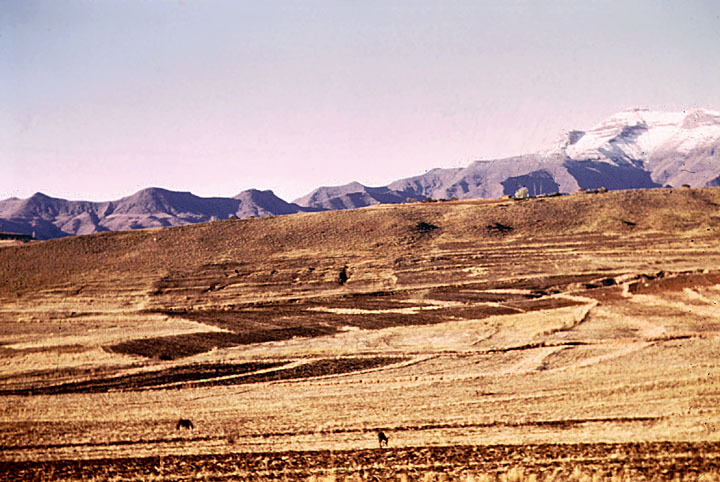 High Plateau/High Veld: the most dominant physical feature in southern Africa is the high plateau, known locally as the high veld. It comprises more than three-quarters of the region’s area. 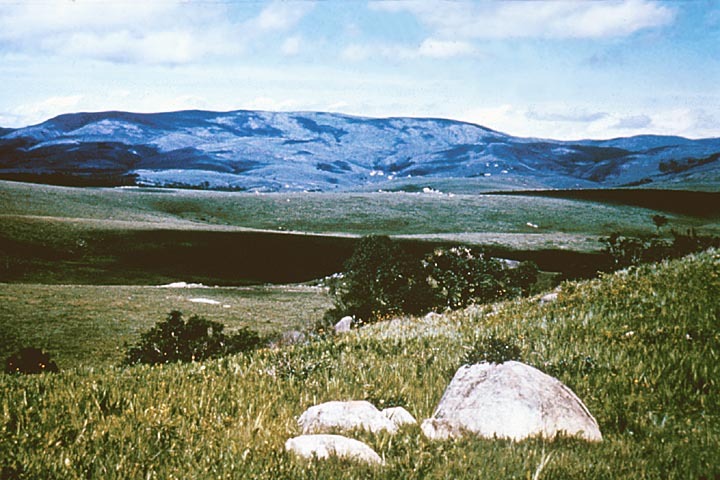 Geologists tell us that the high veld used to be a huge mountain system that was worn-down over millions of years of erosion by wind, rain, and heat. 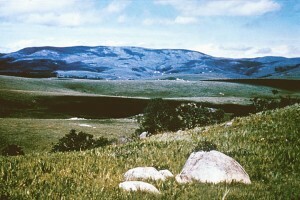 Indeed, the surface rocks that dot the high veld are among the very oldest rocks in the world. Western coastal plain: a narrow coastal plain borders the Atlantic Ocean along the west coast of southern Africa. Unlike the east coastal plain that is quite fertile, the western coastal plain is barren. The Bengeula ocean- current, which runs along the west coast of the region, brings cold water from the South Pole. 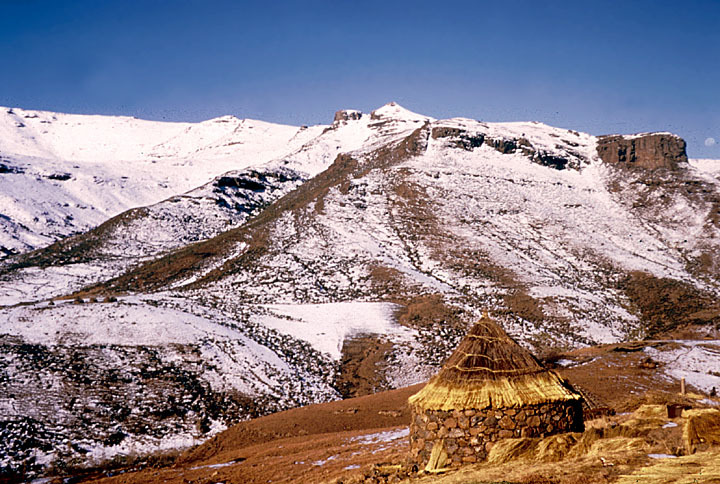 This cold current greatly reduces the amount of rainfall that falls along the western coastal areas of southern Africa resulting semi-arid and desert vegetation in the western coastal plains. Three major river systems drain the region of southern Africa (see Map Six). The Zambezi River, the longest river in the region, forms a large river basin and water shed that covers the western third of Angola, most of Zambia, the northern half of Zimbabwe, almost all of Malawi, and central Mozambique, an area almost as large of the United States east of the Mississippi River! 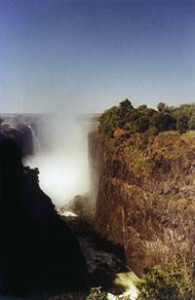 The Zambezi River has a number of important tributaries including the Kafue, Luwangwa, and Shire Rivers. 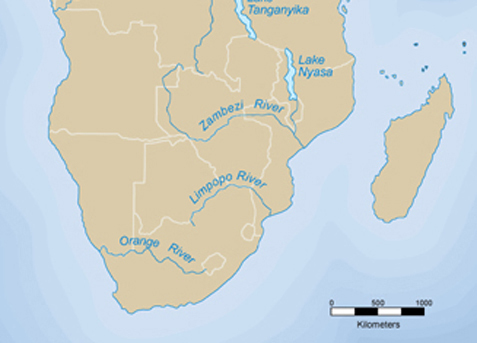 The Limpopo River has its source in Botswana, and on its way to the Indian Ocean, it forms the border between Botswana and South Africa and between Zimbabwe and South Africa before flowing through southern Mozambique. The Orange River and its major tributary, the Vaal River, form the most important river system in South Africa. 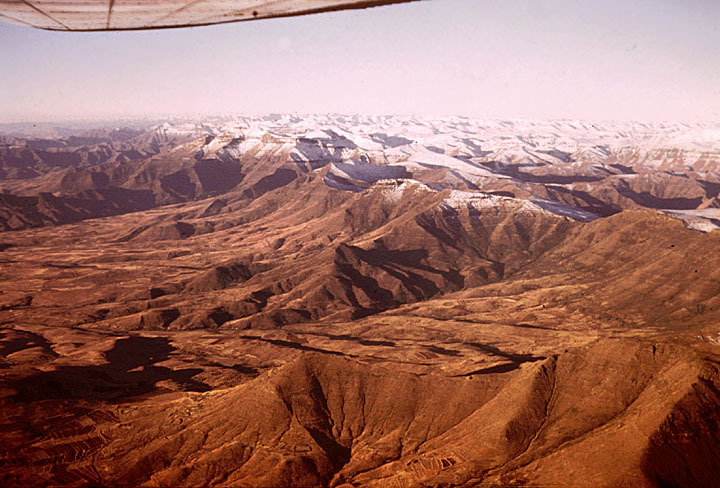 The Orange River has it source in the mountains of Lesotho, and unlike the Zambezi and Limpopo Rivers which flow from west to east emptying into the Indian Ocean, the Orange River flows westwards to the Atlantic Ocean after forming the southern Namibian border with South Africa. You will remember that major river systems in other parts of Africa—for example the Nile River (north Africa) and Niger River (West Africa), form “highways into the interior” of Africa. However, this is not the case with the three major river systems in southern Africa. Can you think of why this may be the case? Take a look at Map Five: Physical Map of South Africa. Where are the sources of these rivers? What are the physical features of the landscape at the source and through which the rivers run before they reach the coastal plains and flow into the ocean? That’s right—all of these rivers originate in and flow through highland areas for most of their journey to the ocean. 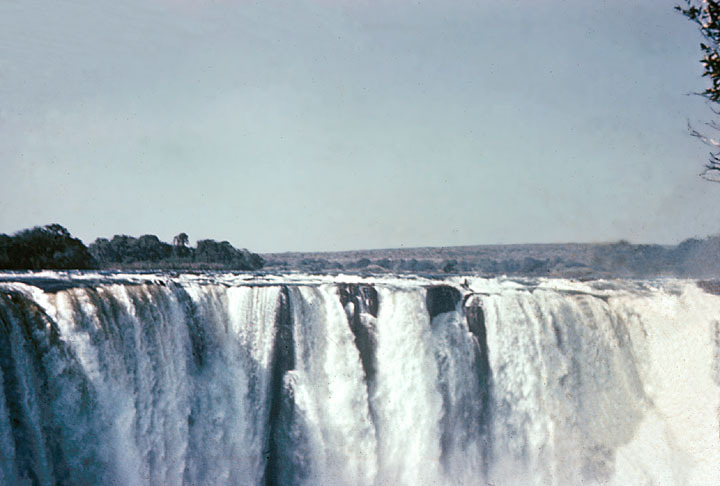 Along the way, the rivers are responsible for much erosion carving out giant canyons and gorges and creating massive rapids and waterfalls—including spectacular Victoria Falls, the largest water falls in the world. As these rivers run and plunge across the high veldt, they create some spectacular scenery, but these same features make navigation along these major river systems impossible. 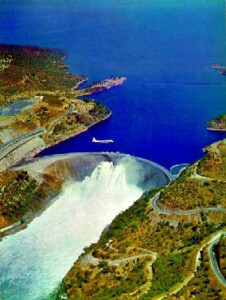 Consequently, unlike the Nile and Niger rivers (or the Mississippi River in the U.S.), these rivers do not facilitate the movement of natural resources (mineral or agricultural), industrial goods, or people. However, the same physical factors that make navigation impossible on these rivers, provide the potential for hydro-electric power. In the last 50 years, three large hydro electric dams have been developed on the Zambezi River system alone! 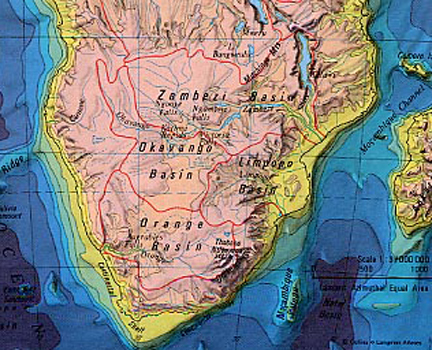 Look carefully at Map Five—along the central Zambezi river valley you see three of the largest hydro-electric (and irrigation) dams in Africa: Kariba, Kafue, and Cahora Bassa. 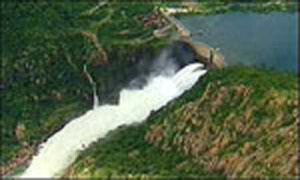 These dams provide more than 50% of the electricity needs of Mozambique, Zambia and Zimbabwe. Water is essential to all human activity. 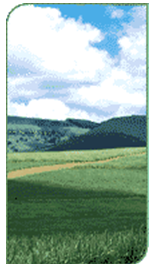 This is particularly true for societies, such as those in southern Africa, that are dependent on agriculture. 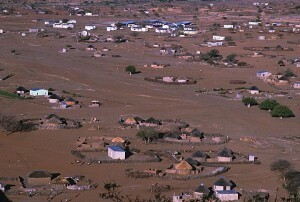 Southern Africa has one rainy season each year. For the vast majority of the region, the rains come between November and March. 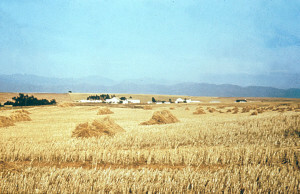 For a small area on the southern tip of South Africa, the rains come between June and August each year during their winter season. This climate, with wet, relatively mild winters, is very similar to that of southern Europe. Consequently, it is known as a Mediterranean climate. 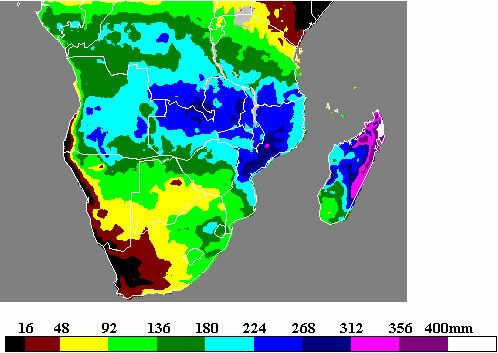 Take a close look at Map Seven: Rainfall in Southern Africa: January. Remember that January is in the middle of the southern African rainy season. 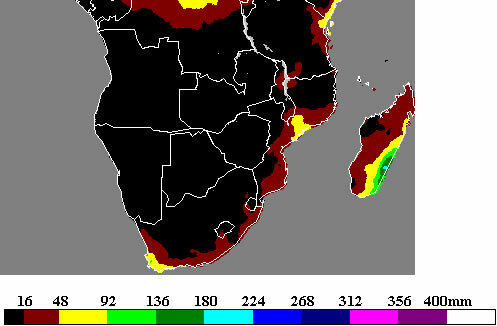 Compare this map with the Map Eight: Rainfall in Southern Africa: July, which is in the middle of the southern African dry season. What can we learn from the information contained on these maps? For example, within this region, what area gets the most rainfall? Does the northern part of the region get more or less than the southern part of the region? If you move from east to west does it get dryer or wetter? 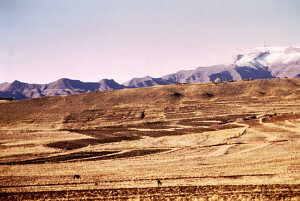 Natural Vegetation of Southern Africa. Carefully study the information on Map Nine. Based on this information, what types of agriculture do you think are best suited for the different vegetation zones in southern Africa? 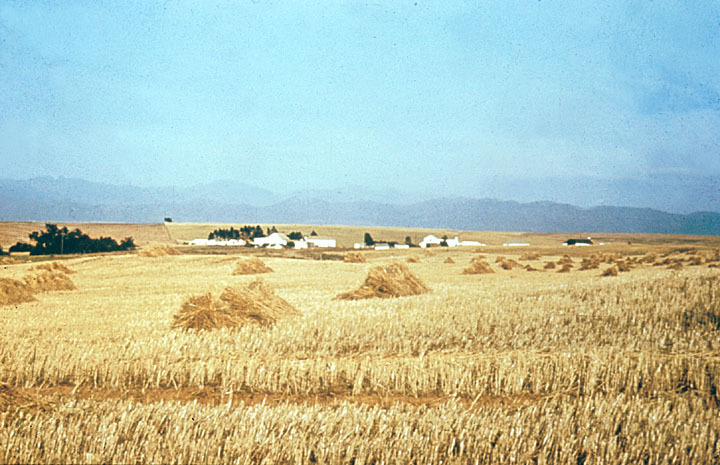 Are there areas of southern Africa that are not suitable for any type of agriculture? If so, how do you think people who may live in these zones make a living? 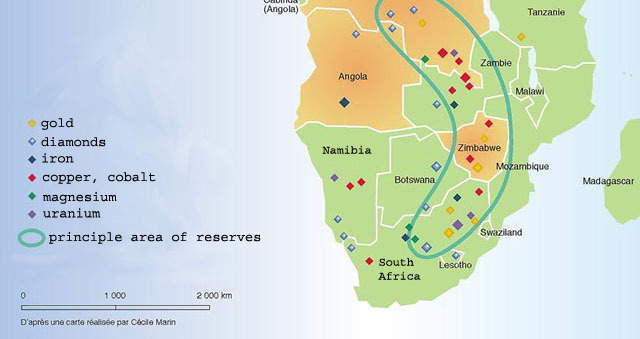 Great Zimbabwe The southern African region of Africa is blessed with mineral wealth as is amply demonstrated by Map 10: Mineral Resources in Southern Africa. 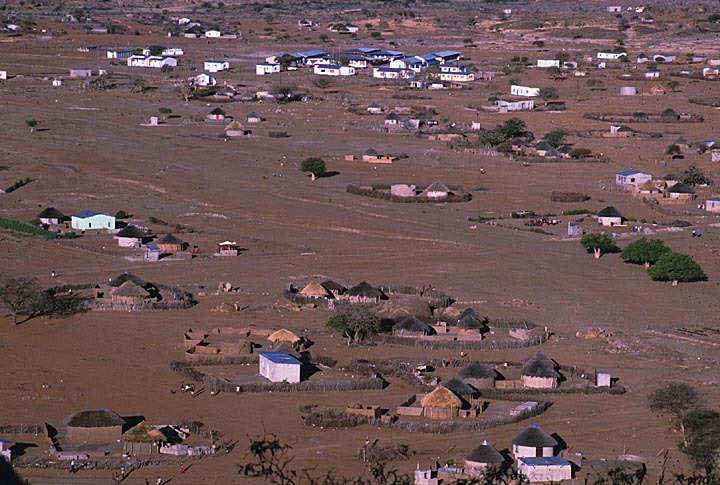 Archaeological records show that the indigenous populations of southern Africa have mined, smelted and made tools, currency, and religious icons from iron, lead, brass, and gold for nearly 2,000 years. For nearly as long, people who lived in areas of mineral wealth have traded minerals with neighbors and more distant peoples. Indeed, strong centralized kingdoms developed in areas of mineral wealth. 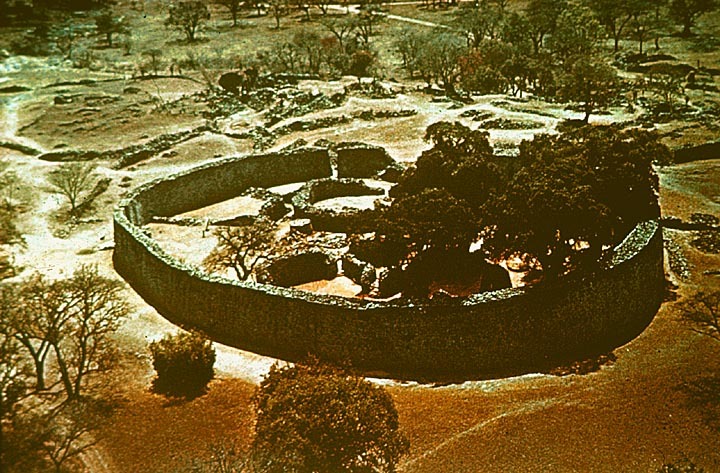 For example, Great Zimbabwe, which you studied in Module Seven A, became a strong kingdom by controlling gold production in the area between the Limpopo and Zambezi Rivers. Minerals played a very important part in the more recent history of southern Africa. 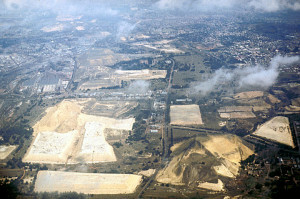 Mineral resources and the promise of quick and great riches attracted both investment and settlers from Europe. The discovery of the largest diamond in the world (to date) at Kimberly in 1864 and huge gold deposits at Witswatersrand in 1885 changed the history of South Africa as thousands of prospectors flooded into the dry interior of the highveldt—not unlike the California Gold Rush in the middle of the 19th century. 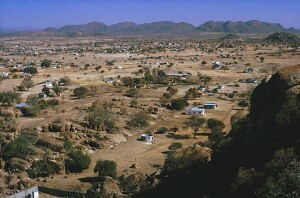 The promise of additional mineral riches further into the interior of southern Africa directly led to the colonization of the areas north of the Limpopo River. 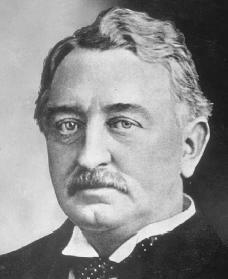 Cecil Rhodes, who made a huge fortune by gaining control of the diamond mines at Kimberly, used his wealth to expand colonialism in southern Africa. 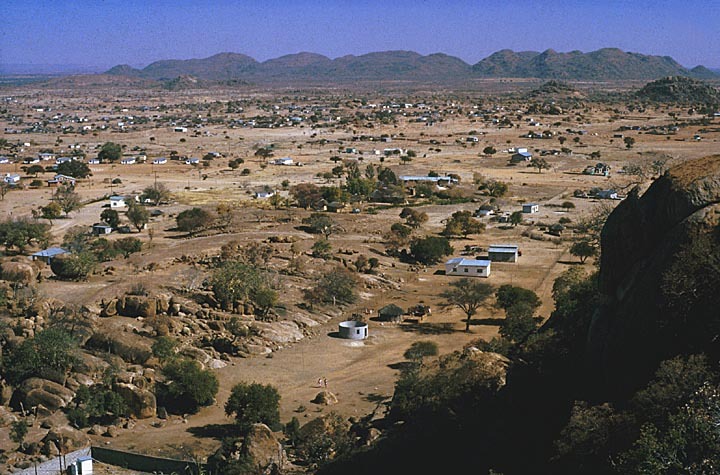 In 1888, he received a royal charter from the British government to form the British South African Company, whose sole purpose was to colonize the areas north of the Limpopo River and through colonization to gain control of what Rhodes hoped would be great mineral wealth. 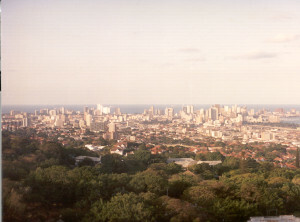 Between 1890 and 1900, Rhode’s Company gained control of a large territory that included many different indigenous peoples and kingdoms in what is today the three countries of Malawi, Zambia and Zimbabwe. Can you imagine? One man and his Company controlled a territory much larger than the state of Texas! 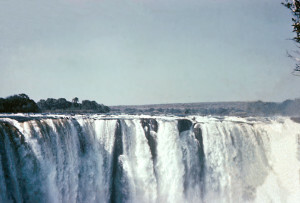 In fact, two of these colonies were originally named after him: Northern Rhodesia (Zambia), Southern Rhodesia (Zimbabwe). 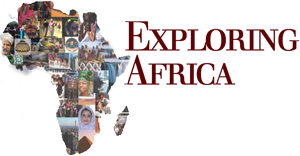 However, as was discussed in Module Nine: African Economies, while mineral resources can play an important role in stimulating economic development, it is also true that dependence on a single mineral resource can be disastrous to a national economy. 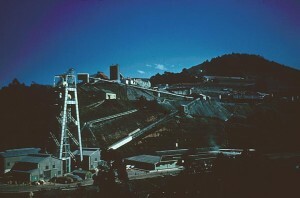 Take, for example, the case of Zambia, which was until recently, one of the world’s major producers of copper. 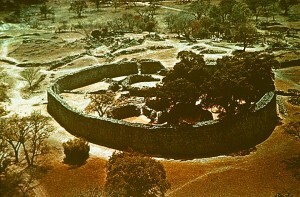 The colonial economy of Zambia (Northern Rhodesia) was totally dominated by copper. 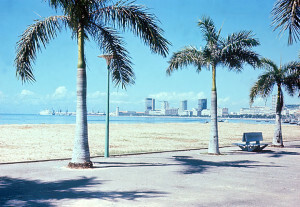 Following independence in 1964, the new government of Zambia used the then plentiful revenues from copper to develop the social (schools, health care) and physical (roads and communication) infrastructure of the country. However, little attention was given to diversifying the economy of Zambia.Minerals continue to play a very important economic role in the southern African region. Mining and mineral processing are the most important sector of the economies of Angola (petroleum/oil), Botswana (diamonds), Namibia (diamonds), South Africa (gold) and Zambia (copper). As we learned in Module Nine, a diverse (more than one major source of production) economic base is important to economic progress and development. 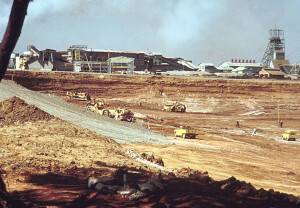 Unfortunately in the 1980s, the demand for copper world-wide dropped dramatically resulting in a steep decline in the amount of copper that Zambia was able to export (sell abroad) and in the price it was paid for copper. Since Zambia was so totally dependent on copper, the country’s economy suffered a severe depression as a result of the decline in the amount of copper that it was able to export. 1. Interpreting Cartoons: Do you ever look at the political cartoons that are published in the newspapers that you read or in news magazines that your parents may subscribe to? Through the use of satire and humor, cartoon artists can make strong statements about people and events that are in the news. 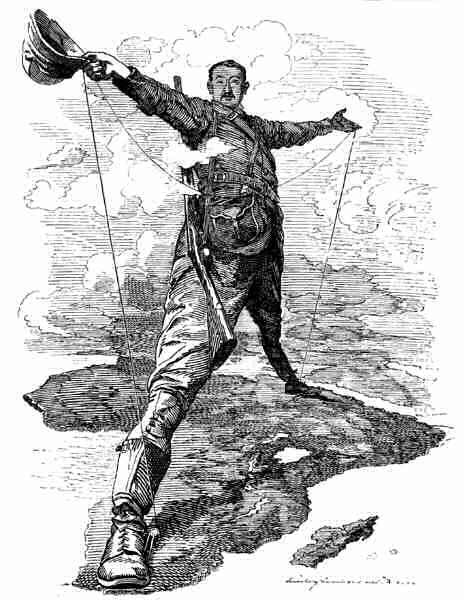 Take a careful look at the cartoon of Cecil Rhodes standing on a map of Africa. This cartoon was published in London in the 1890s. What do you think the political cartoonist is trying to say with this illustration? What is his opinion of Cecil Rhodes? Do you think that the cartoonist is sympathetic with Rhode’s colonial goals? Now try drawing your own cartoon in which you indicate what you think about Rhode’s actions in southern Africa. If you would like additional information about Rhodes, you can do a web-search for sites that have information on Rhodes. Take a careful look at all the maps used in this section (Maps 5- 10). These maps and the accompanying text provide a lot of information about the physical and social geography of southern Africa. However, one important map is missing—a map that shows the population density of southern Africa. Population density measures the number of people that live in a set area, usually a square mile or square kilometer. You would expect the population density in a city to be much higher than the population density in a rural area. Similarly, population density can vary a great deal between different locations within a region. Your teacher will print out a copy of Map Eleven: Population Density Map of Southern Africa. Using the following three categories: high density (red or orange), medium density (brown), low density (yellow) fill/color in the entire map of southern Africa. Remember to use the information from maps 5-10 to help you decide how to divide the region by population density.